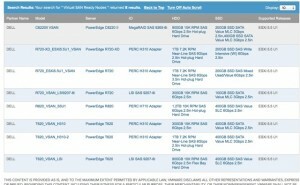 Looking for VMware Storage Content? Looking for Demo’s, Videos, Design and sizing guides, VVOLs, SRM, VSAN? Did you get a fake ReadyNode? Maybe its the streets of NYC, or a corner stall in a mall in Bangkok, or even Harwin St here in Houston. Someone tried to sell you a cut rate watch or sunglasses. Maybe the lettering was off, or the gold looked a bit flakey but you passed on that possibly non-genuine watch or sunglasses. It might have even been made in the same factory, but it is clear the QC might have issues. You would not expect the same outcome as getting the real thing. The same thing can happen in ReadyNodes. 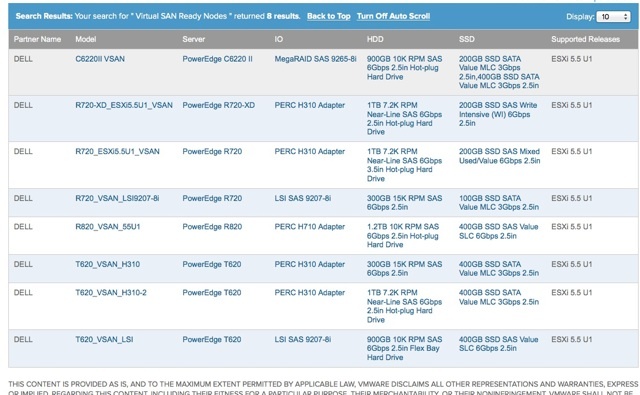 Real ReadyNodes for VMware vSAN have a couple key points. They are tested. All of the components have been tested together and certified. Beware anyone in software-defined storage who doesn’t have some type of certification program as this opens the doors to lower quality components, or hardware/driver/firmware compatibility issues. 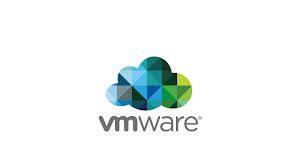 VMware has validated satisfactory performance with the ReadyNode configurations. A Real ReadyNode looks beyond “will these components physically connect” and if they will actually deliver. vSAN ReadyNodes offer choice. ReadyNodes are available from over a dozen different server OEM’s. The VMware vSAN Compatibility Guide offers over a thousand verified hardware components also to supplement these ReadyNodes for further customization. ReadyNodes are not limited to a single server or compoennt vendor. They are 100% supported by VMware. Real VMware ReadyNodes don’t require virtual machines to mount, present or consume storage, or non-VMware supported VIBs be installed. They are Mature. 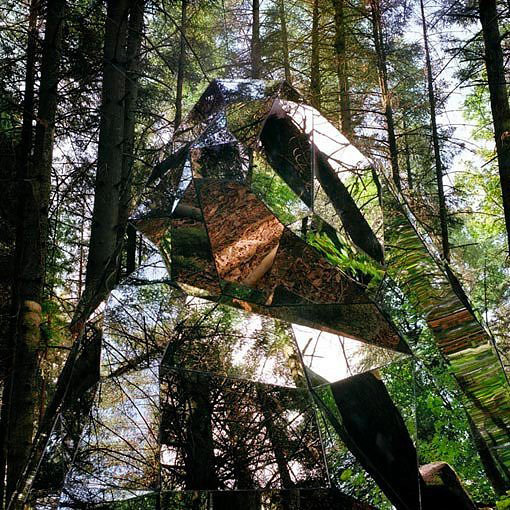 They run a 7th release, battle-tested, mature hypervisor integrated storage stack. So what do you do if you’ve ended up with a fake ReadyNode? Unlike the fake watch I had to throw away, you can check with the vSAN compatibility list and see if you can with minimal controller or storage devices changes convert your system in place over to vSAN. Remember if your running ESXI 5.5 update 1 or newer, you already have vSAN software installed. You just need to license and enable it! 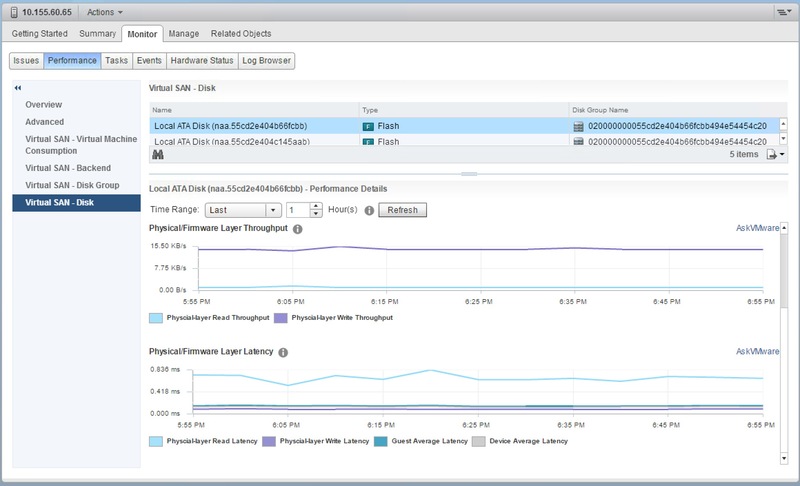 One of the newest exciting features of Virtual SAN 6.2 is the new performance service. 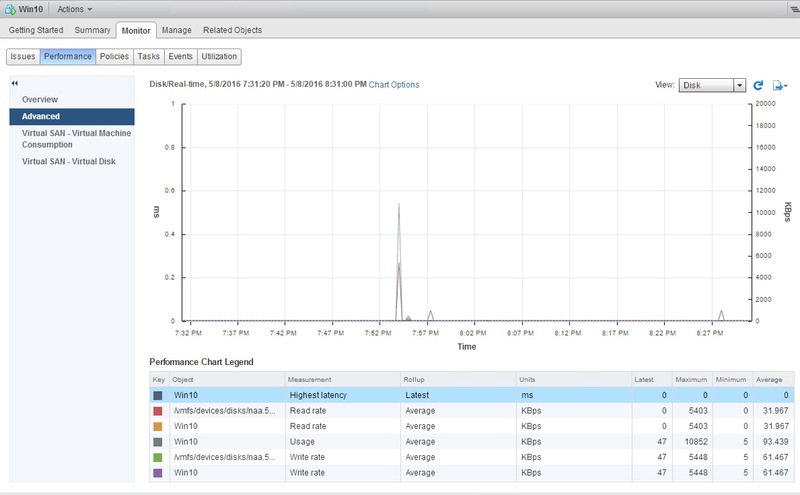 This is an ESXi native performance monitoring system with API, as well as UI access. One misconception I wanted to be clear on is that it does not require the use of vCenter Operations Manager, or the vCenter database. Instead, Virtual SAN performance service uses the Virtual SAN object store to store its data in a distributed and protected fashion. For smaller environments who do not want the overhead of VSOM this is a great solution, and will complement the existing tools. VSOM offers longer term granular performance tracking. 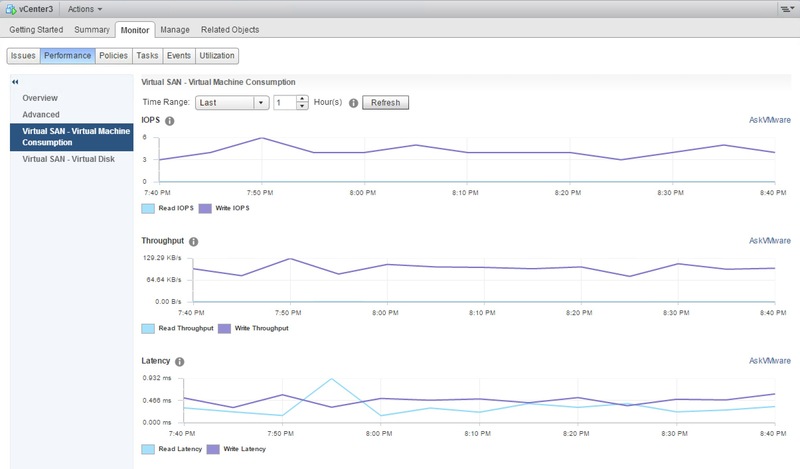 The native Virtual SAN performance service uses the same roll up schedule as vCenter’s normal performance graphs. VSOM allows for forecasting and capacity planning as it analysis trends. VSOM allows overlaying performance from multiple area’s and systems (Including things like switching, application KPI’s) to do root cause and anomaly analysis and correlation. 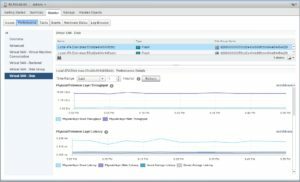 VSOM offers powerful integration with LogInsight allowing event correlation with performance graphs. 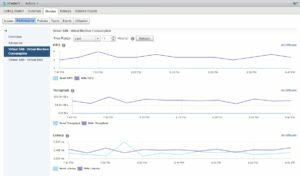 VSOM allows for rolling up performance information across hundreds (or thousands of sites) into larger dashboards. In heterogenous enivrements using traditional storage, VSOM allows collecting fabric, and array performance information. So if I don’t enable this service (or deploy VSOM) what do I get? You still get basic Latency, IOPS, throughput information from the normal vCenter performance graphs by looking at the vDisk layer. You miss out on back end component views (things like internal SSD queues and latency) as well as datastore/cluster wide metrics, but you can still troubleshoot basic issues with the built in performance graphs. It was designed originally for internal troubleshooting and lacks consistency with the vCenter UI. It ran on its own web service separately and was not integrated into the existing vCenter graphs. It was not recommended to run it continuously, or to deploy a separate Virtual machine/Container to run it from. All of these limitations have been addressed with the Virtual SAN performance service. I expect the performance service will largely replace VSAN Observer uses. 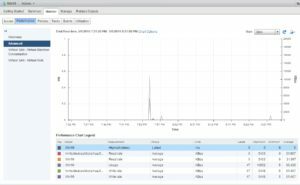 VSAN observer will still be useful for customers who have not upgraded to VSAN 6.2 or where you do not have capacity available for the performance database. There is an extensive amount of metrics that can be reviewed. 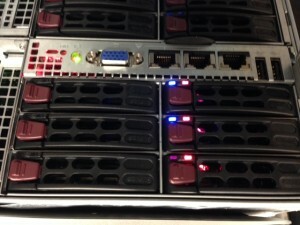 It offers “top down” visibility of cluster wide performance, and virtual machine IOPS and latency. Virtual SAN Performance service also offers “bottom up” visibility into device latency and queues on individual capacity and cache devices. For quick troubleshooting of issues, or verification of performnace it is a great and simple tool that can be turned on with a single checkbox. Up to 255GB of capacity on the Virtual SAN datastore (You can choose the storage policy it uses). In order to enable it simple follow these instructions. I would like to say that this post was inspired by Chad’s guide to storage architectures. When talking to customers over the years a recurring problem surfaced. Storage historically in the smaller enterprises tended towards people going “all in” on one big array. The idea was that by consolidating the purchasing of all of the different application groups, and teams they could get the most “bang for buck”. The upsides are obvious (Fewer silo’s and consolidation of resources and platforms means lower capex/opex costs). The performance downsides were annoying but could be mitigated. (normally noisy neighbor performance issues). That said the real downside to having one (or a few) big arrays are often found hidden on the operational side. Many customers trying to stretch their budget often ended up putting Test/Dev/QA and production on the same array (I’ve seen Fortune 100 companies do this with business critical workloads). This leads to one team demanding 2 year old firmware for stability, and the teams needing agility trying to get upgrades. The battle between stability and agility gets fought regularly in the change control committee meetings further wasting more people’s time. Audit/regime change/regulatory/customer demands require an air gap be established for a new or existing workload. Array partitioning features are nice, but the demands often extend beyond this. In some cases, organizations that had previously shared resources would part ways. (divestment, operational restructuring, budgetary firewalls). Some storage workloads just need more performance than everyone else, and often the cost of the upgrade is increased by the other workloads on the array that will gain no material benefit. Database Administrators often point to a lack of dedicated resources when performance problems arise. Providing isolation for these workloads historically involved buying an exotic non-x86 processor, and a “black box” appliance that required expensive specialty skills on top of significant Capex cost. I like to call these boxes “cloaking devices” as they often are often completely hidden from the normal infrastructure monitoring teams. A benefit to using a Scale out (Type III) approach is that the storage can be scaled down (or even divided). VMware VSAN can evacuate data from a host, and allow you to shift its resources to another cluster. As Hybrid nodes can push up to 40K IOPS (and all flash over 100K) allowing even smaller clusters to hold their own on disk performance. It is worth noting that the reverse action is also possible. When a legacy application is retired, the cluster that served it can be upgraded and merged into other clusters. In this way the isolation is really just a resource silo (the least threatening of all IT silos). You can still use the same software stack, and leverage the same skill set while keeping change control, auditors and developers happy. Even the Database administrators will be happy to learn that they can push millions of orders per minute with a simple 4 node cluster. In principal I still like to avoid silos. If they must exist, I would suggest trying to find a way that the hardware that makes them up is highly portable and re-usable and VSAN and vSphere can help with that quite a bit. Spiceworks Dec 1st @ 1PM Central- “Is blade architecture dead” a panel discussion on why HCI is replacing legacy blade designs, and talk about use cases for VMware VSAN. Micron Dec 3rd @ 2PM Central – “Go All Flash or go home” We will discuss what is new with all flash VSAN, what fast new things Micron’s performance lab is up to, and an amazing discussion/QA with Micron’s team. Specifically this should be a great discussion about why 10K and 15K RPM drives are no longer going to make sense going forward. Intel Dec 16th @ 12PM Central – This is looking to be a great discussion around why Intel architecture (Network, Storage, Compute) is powerful for getting the most out of VMware Virtual SAN. 2 x 1TB Seagate Constellation SAS drives. 1 x 400GB Intel SSD S3700. 12 x 16GB DDR3 RAM (192GB). The Back end Switches have been upgraded to the more respectable M7100 NetGear switches. Now the LSI 2208 Controller for this is not a pass through SAS controller but an actual RAID controller. This does add some setup, but it does have a significant queue depth advantage over the 2008 in my current lab (25 vs 600). Queues are particularly important when dropping out of cache bursts of writes to my SAS drives. (Say from a VDI recompose). Also Deep queues help SSD’s internally optimize commands for write coalescence internally. If you go into the GUI at first you’ll be greeted with only RAID 0 as an option for setting up the drives. After a quick email to Reza at SuperMicro he directed me to how to use the CLI to get this done. CNTRL + Y will get you into the Megaraid CLI which is required to set JBOD mode so SMART info will be passed through to ESXi. They look angry don’t they? Now if you havn’t upgraded the firware to at least MR5.5 (23.10.0.-0021) you’ll discover that you have red drive lights on your drives. You’ll want to grab your handy dos boot disk and get the firmware from SuperMicro’s FTP. I’d like to thank Lucid Solution’s guide for ZFS as a great reference. I’d like to give a shout out to the people who made this build possible. Phil Lessley @AKSeqSolTech for introducing me to the joys of SuperMicro FatTwin’s some time ago. Synchronet, for continuing to fund great lab hardware and finding customers wanting to deploy revolutionary storage products.